Ghosts, Hauntings & Other Supernatural Things (G.H.O.S.T) Club. Formed Dec 2007. Respect. Research. Reflect. Offices, no matter which office you work in, come across or been to, all have their fair share of spooks and ghost stories...Is it an ingenious conspiracy started by representatives working for the government to force people not to work too late in the office and have more work life balance? Or is there some real truth to the world of paranormal that resides in all offices? Some Feng Shui believers argue that offices are considered temporary spaces where people come, work and go, hence not leaving alot of 'yang' energy or be too emotionally attached to the place, hence allowing other beings to want to call this place their home. Other people will argue that some offices being a stressful environment share tales of suicide, hanging and strong negative emotional attachment to these places that cause offices to have alot of negative energy (things that other beings strive on and 'feed'). 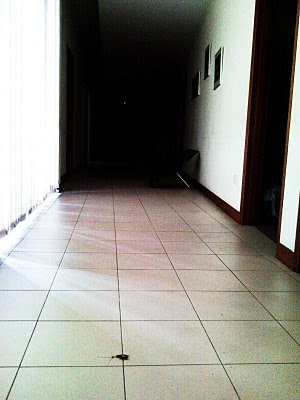 What are the truths behind offices hauntings? We explore this more, in this special investigation episode! They say that offices in daytime looks aye okay. 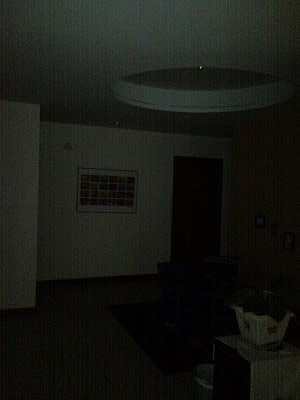 But when night falls, some offices plunge into a world of darkness, strange shadows and weird sounds. It is night that our other 'friends' come to 'work'. It is like a perfect balance. We work in the day time, 'they' work at night, hence ensuring that there will not be a clash in the time or existence. Or so they say. Well, except for the one or two employees who work late at night, unable to finish their work or rushing for some projects. These employees are usually the victims. I used to be a skeptic about office hauntings or strange tales, somehow, when people are tired, stressed or alone, they tend to hallucinate or imagine strange things. Well, not until I experienced it myself. My little office is situated under a void deck. Void decks as they say, being void spaces, are places where wandering spirits strive on, walk around or just happen to pass. Maybe some got trapped in offices, and never released? 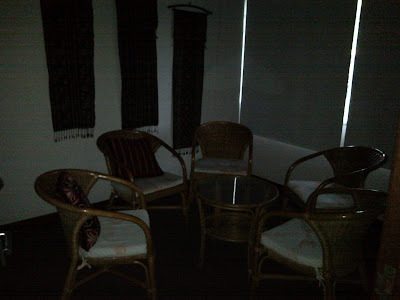 I would say that it was my paranormal experience in my office that left me intrigued in the world of paranormal. Whether it was imagined or real, the fact of experiencing some things unexplainable made me want to find out more about the 'other world'. And so, began my paranormal journey! Back in 2004, I started work in my humble office. Small, cosy and filled with warmth, laughter and activities in the day time. But somehow at night, a strange silence and an eerie darkness transcends upon the office, especially the place i call 'the corridor': to the other world. 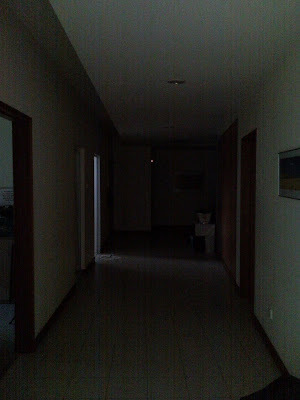 Somehow, this corridor is so quiet at night that you dont even hear the crickets. Its just a dead silence. Shadows seem to dart, and your eyes seem to play alot of tricks on you. Here are 2 such stories. One of my colleagues who has a 'Third Eye', is one that works late at night often. Doing programme stuff, she is always rushing to plan and hold meetings late at night. Together with her, I also find myself working late at night, somehow, there is always so much work to do! She related this incident to me where there was one ocassion where she was about to leave home after staying till about 10+ at night, with one of my other male colleague also working late. Having had a long and tiring day, she tiredly went to the 'corridor' to unwind the corridor blinds, something that all workers have to do if they are the last to leave. 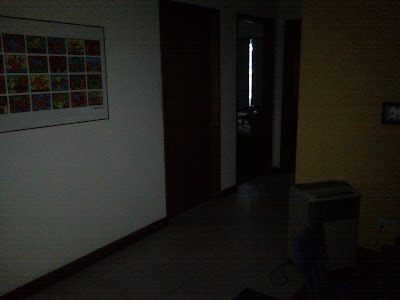 This is quite a spooky prospect as somehow as we stand there to unwind the blinds, it takes about10-15 seconds doing that. That 15 seconds always feel like something will happen, or that you will see 'something' in the reflection of the transparent window. On that ocassion, my colleague was winding the blinds when she said she suddenly saw a man. She thought that man was my colleague, naturally, her first instincts. But she quickly realized it wasn't because this was an old man! 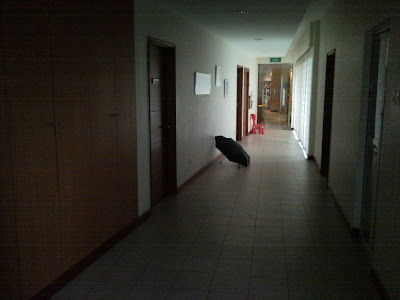 She freaked out and ran back to the office, and asked my colleague if he came to the corridor. He said he didn't! One night, I was working late alone, preparing my center for an event the next day. It was about 11+, going onto midnight, as I was setting up the activity room for my event. I was putting up some cloth as we are having a theatre production, so i was perched up on a latter and pinning the black cloths around. Suddenly, I turned my head to the left and I saw a shadow figure standing outside the door. I was stunned. Initially, I instantly thought must be another colleague but immediately, I realized i was the only one at office, and that really freak me out too! It was as if someone was looking at me do my things, wondering what i was doing! And I left office immediately after that, putting my preparation to the next day! And then there is also the other incident involving me. 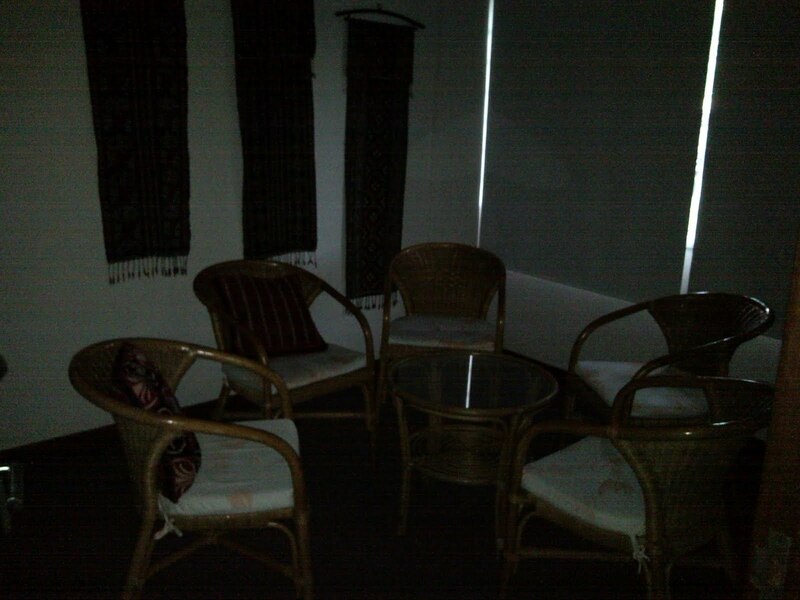 This was sometime back in 2005, when I was working late again, alone at night. This time, I was absolutely sure i was alone, because my last colleague said goodbye to me, and encouraged me not to stay in office too late. I remembered i was doing some admin work that night, and about 1 hour plus in, after my colleague left, suddenly, my phone received an intercomm beep. We usually have this beep when someone in the office wants to inform us something and beeps our individual phone to alert us. When I first heard the beep, i was kind of taken aback because I realized i was the only one left! Still, i decided to ignore it, perhaps it was a technical glitch. Deep down though, i was beginning to feel a little strange. Anyway, I continued doing my work, and about 10 mins later, i received another beep! Now this time it really freaked me out, because it is certainly not a technical glitch. I was getting concerned. I summoned my courage and looked around the office. If there is an intercomm, there is a parent phone source that does the intercomm. I walked around and realized it was my fellow colleague, in my cubicle! Hmm but there is absolutely no one around! Her phone was lighted up, indicating that her phone was the intercomm source! Now it is really strange. I wonder if it could be a cockroach or insect. But to intercomm, you need to press the ICM button first, followed by the double digit number corresponding to my phone. So that is 3 buttons you need to press. Even if its an insect, so coincidental? Cannot be!! Again, i see it as a sign and i left office immediately! And then there is the most recent incident that I still dont know what to make out of it. And I have some evidence to show. Perhaps someone can offer a logical explanation! There was one sunday morning when i went back to the office to do some work, when i walked towards the corridor area, I suddenly discovered some things on the floor. 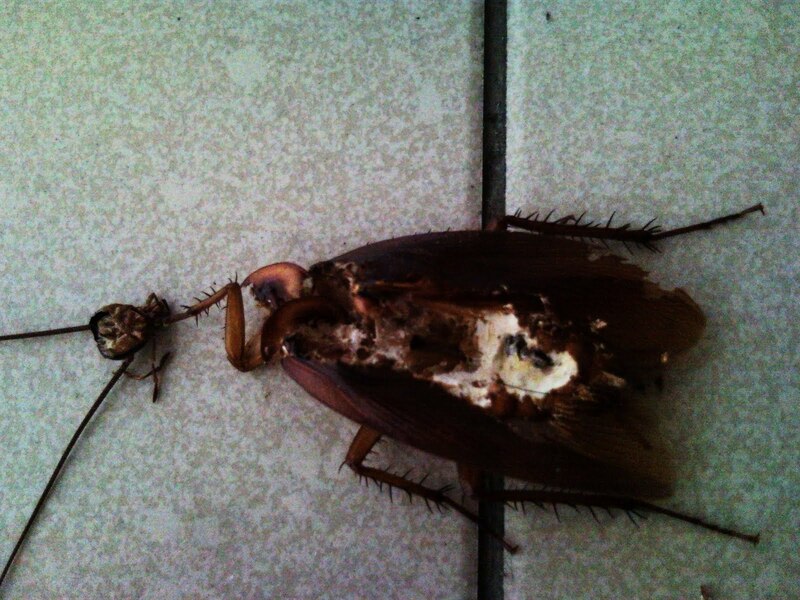 Upon closer inspection, i realized that it was a dead cockroach. (See picture below). Normally, it wouldn't have alarmed me, because we do find cockroaches quite often, in our office premises, since it is located at a void deck and near to rubbish chutes. But somehow, something about this discovery made me take notice of the queer cockroach body. I realized that the cockroach didn't just die. It died a horrible death. It was multilated and it was dissected. Look at the picture. The cockroach was headless. Its head is cut out and left just above the headless body. The body was no better. Somehow it was really strange that the insect's body was cut open, right in the center of its body, revealing a gross inner body. It was strangely dissected in the middle and part of its legs twisted in front. The cockroach wasn't a victim of some prey, as it wasn't eaten. 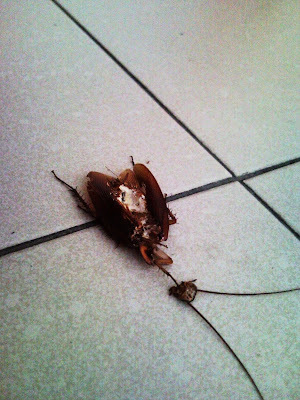 It was as if someone or something played with the cockroach and tortured it. The CSI scene was a gross one, and the body find is anything but bizarre. 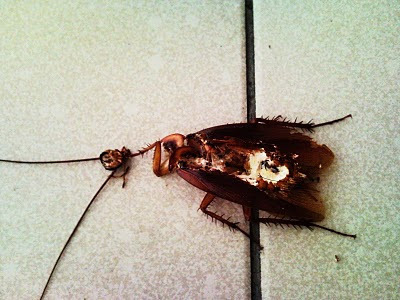 Another picture of the cockroach taken at another angle revealed just unexplanable questions. Who tore the cockroach body up? The cut was quite straight, it wasn't even random tearing out. Usual animals like cats if they are playing, normally will just tear and dissect the cockroach randomly. This isn't random. It was precise! Close up of the dissected cockroach. Notice the stright cut and tear through the mid section of the cockroach body. Simply bizarre! I tried to walk around the 'crime scene' to see if I can spot any explanations or evidence of what may have caused this grisly find. 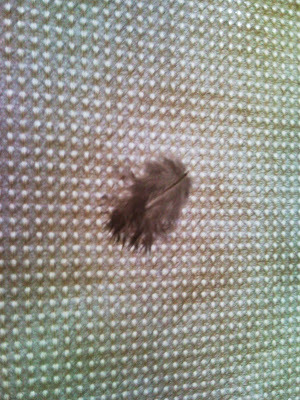 On the corridor blind, i noticed a bird feather on it. It's strange. 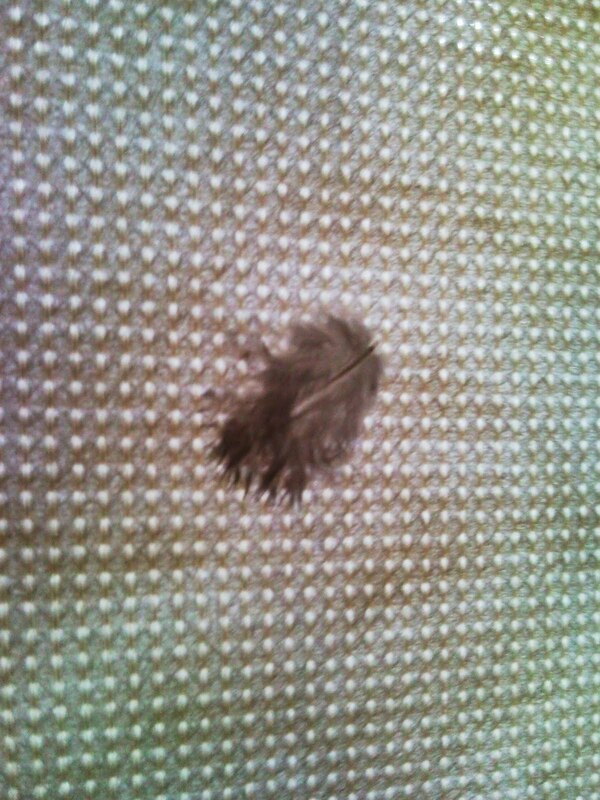 How come there is a bird feather inside our office? 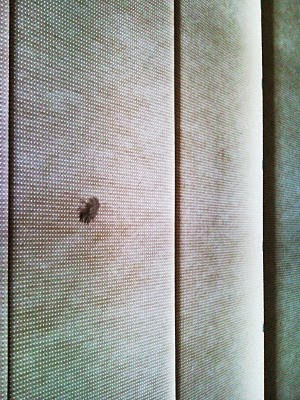 Doesn't it mean that a bird is INSIDE our office? if not how can a bird feather be on the blind? I did a walk around. I didn find any bird! Anyone recognize what kind of bird is that? 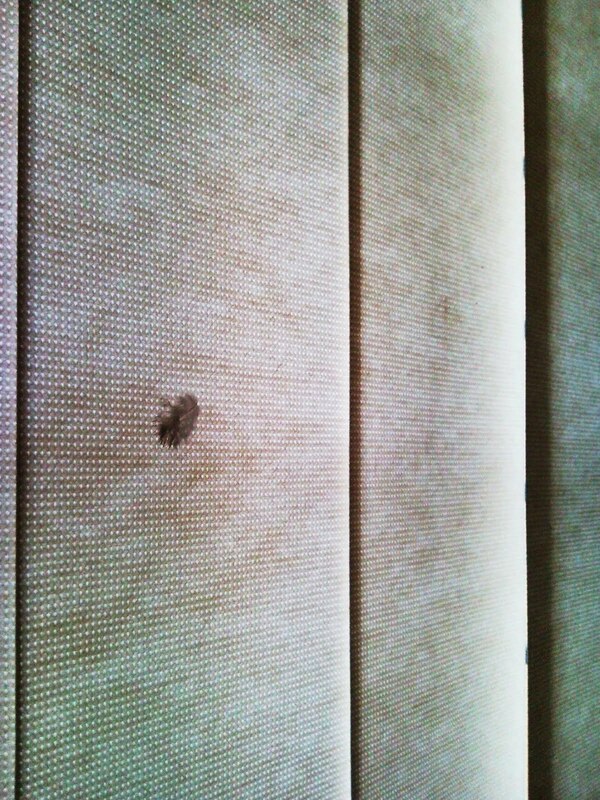 The bird feather on the blind, on another zoom out shot. Just 1 piece of feather on the blind. Equally wierd. 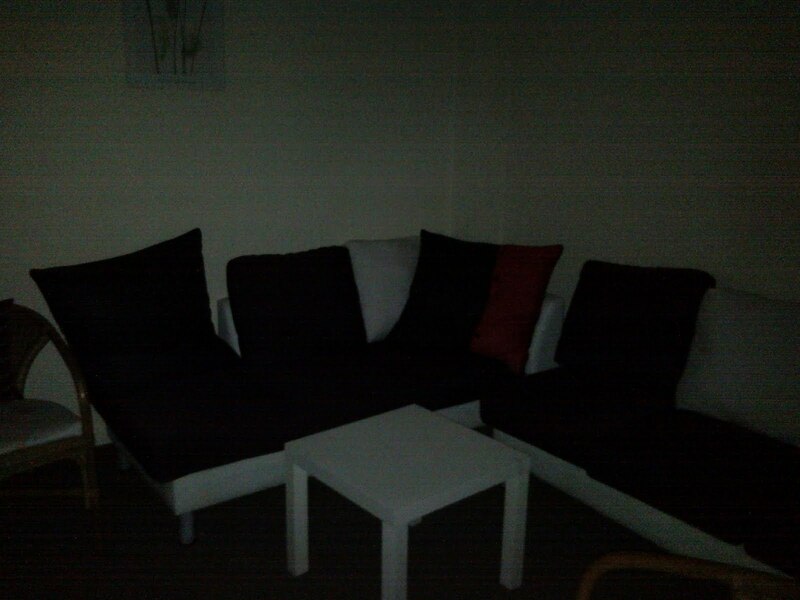 The rest of the blinds were spanking clean and clear of anything else. I was half expecting to find a bird carcass somewhere, but i couldn't find anything after a crime scene walk. 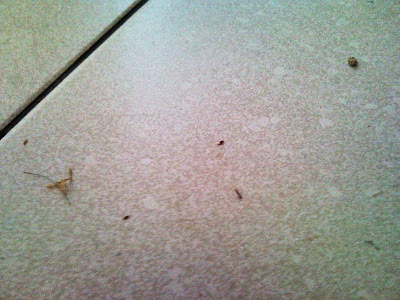 On the floor around the carcass of the cockroach, i noticed some bits of body parts, possibly the cockroach parts, scattering somewhere near the body. I have no clues what it is or what happened. Front view of the cockroach. Tales of how spirits will sometimes dissect animals and tear out their guts and all started to ring in my mind. How strange the organs appear or are dug out, strange slits and un-prey-like finds are all key characteristics of such spiritual attacks. It only deepens the mystery to this find and make me wonder could there be something sinister or unexplanable here. 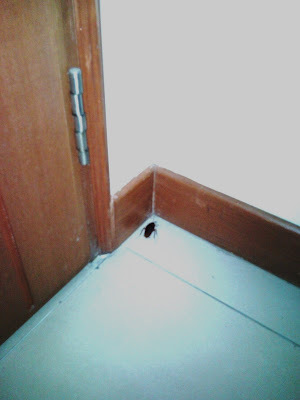 Walking around, i noticed another cockroach against the wall of one of our rooms. It is alive and looks normal. 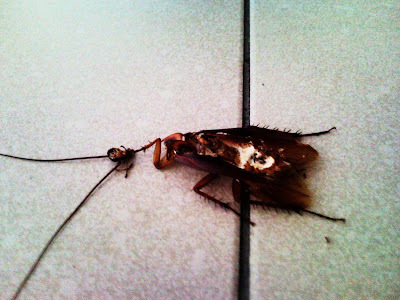 I wonder if it will have the same fate as his fellow insect the next day. 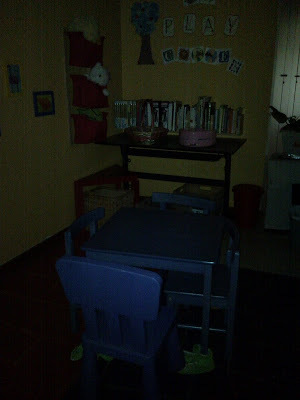 A small play area for kids sits right at the end of the corridor. 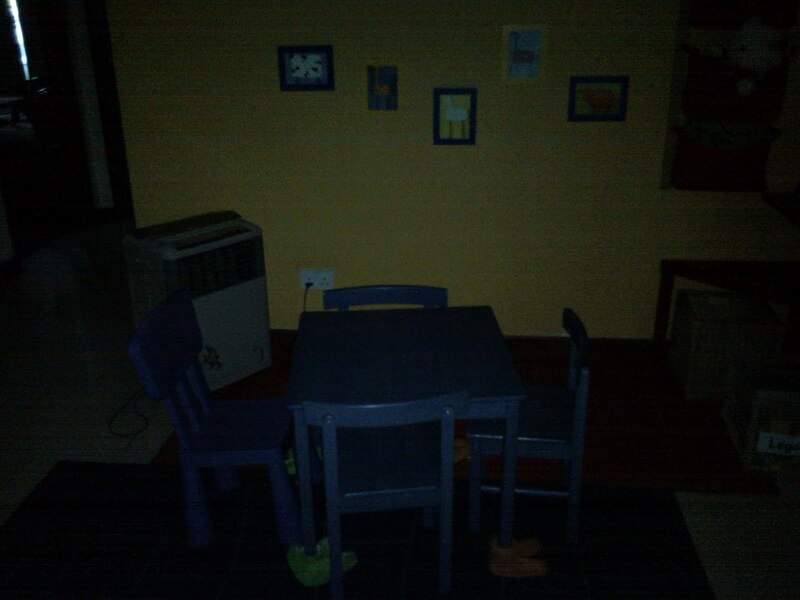 Somehow i always have a feeling that there may be someone playing toys here at night, and that toys are left in strange positions in the morning. Watch too many ghost movies maybe! 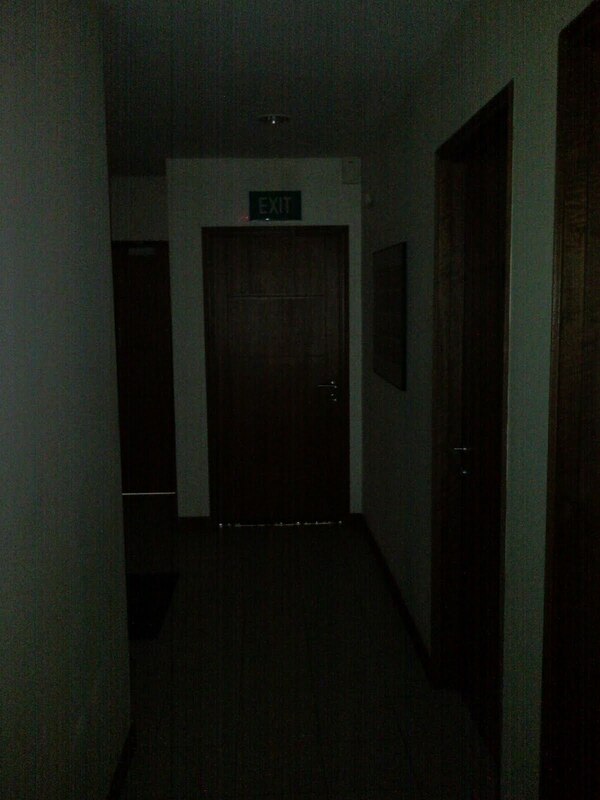 Even in day time, the whole corridor and end part of my office somehow looks creepily dark and very black. 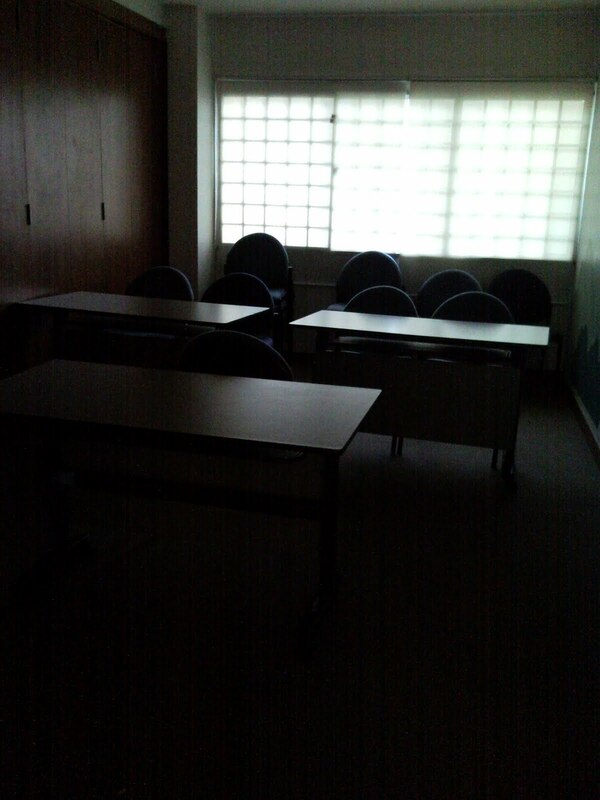 Silence covers the whole place and some eerie feeling somehow always looms. 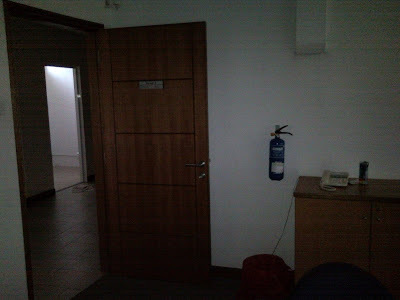 This is the office door of the room that I had seen the strange black shadow figure appearing from outside looking in as i was preparing the room. Well, this office does have some strange stories. 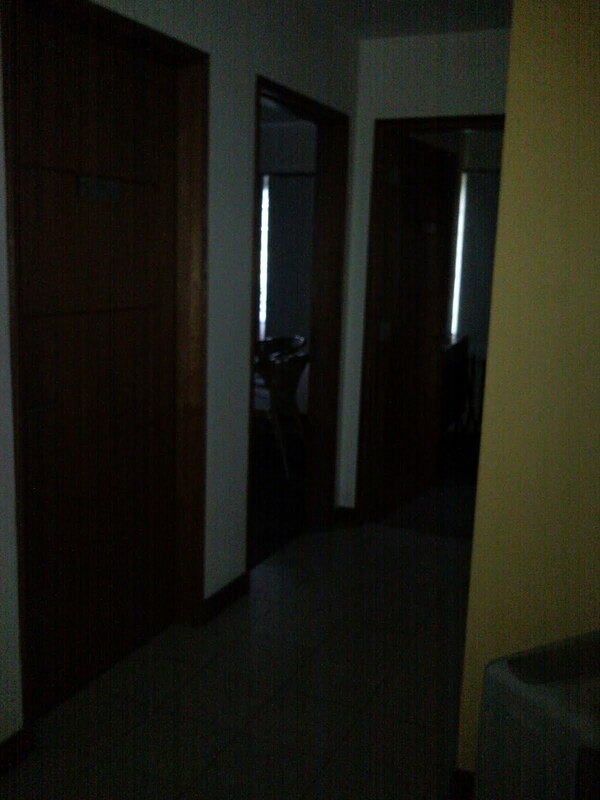 I never quite believe in paranormal activities in office before my time here. But after physically experiencing some strange incidents, I do believe there is something here. But yet, the beings that exist here aren't sinister as they leave us to our own things. Perhaps playful at times but not physically threatening. So well, peaceful co-existence! 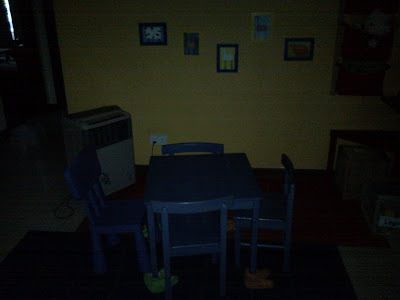 Personal experience & scientific evidence of Haunting present. Limited evidence but personal experience is present. 3-5: Mild possibility of Haunting. Limited evidence and personal experience are present. No feelings or experience to report. Scientific evidence not present or inconclusive. RESPECT the DEAD. GhostClubSG draws a line. 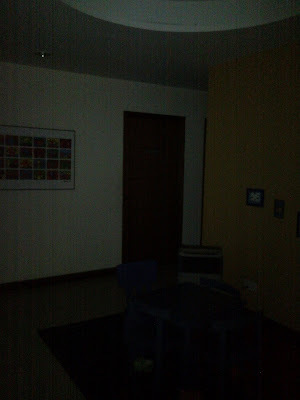 This club blog is dedicated for all youths interested to find out more about the paranormal in Singapore. We go strongly by our 3 principles: Respect, Research & Reflect. We seek to Respect what we cannot see & don't know. Only when we show Respect will we get Respect and it allows us to remain safe in all our expeditions. With that we attempt to understand & appreciate the field of the paranormal via exploratory trips in a non-intrusive manner. We also ensure that we have as many information as we can about any place before we call it haunted. Research gives us a clearer picture without jumping to conclusions. Having gained from our research, explorations & experience, we can finally reflect and make sense of the holistic experience. We then can fully accept and appreciate things that cannot be readily explained by science. If you have any paranormal happenings to share or would like us to investigate, or if you are interested to join us for explorations, email us at ghostclubsg@yahoo.com.sg.